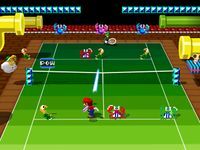 The Mario Classic Court is a court in the game Mario Power Tennis. The standard version of this court is based off of the original stage from the Mario Bros. game, complete with a Mario Bros.-themed background. The gimmick version of this court, however, features Shell Creepers, Crabs, Fighter Flies and Freezies occasionally appearing on the court. They will block a player who walks into them, and they will be unable to move forward. However, hitting the POW Block that appears on the net will flip the enemies on that player's side of the court, allowing them to be defeated just by walking into them, akin to the original Mario Bros. The enemies can even get faster if left undefeated and allowed to flip back over. The minigame Coin Collectors is held in this court. It is unlocked by winning the Fire Cup in Doubles. This page was last edited on February 18, 2019, at 23:09.